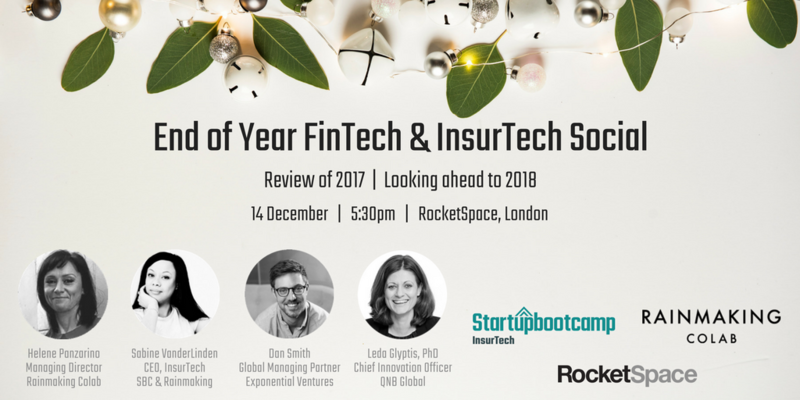 We welcome you to our first Co-Hosted, end of year FinTech & InsurTech in collaboration with Startupbootcamp InsurTech in RocketSpace. Our panel of experts will cover questions including: What are the key trends in FinTech? In InsurTech? What can we expect in 2018? Where are FinTech & InsurTech headed in London and beyond? How are these areas evolving? Come join us for an evening of inspirational learnings and end of year festivities, followed by networking over drinks and nibbles. Doors are open to entrepreneurs, insurance professionals, financial services professionals, tech, InsurTech & FinTech startups, and those promoting innovation in the financial services and insurance industries. Invite a friend! We look forward to seeing you. Please RSVP so we may plan accordingly.